El Flako – Corn Flakes & Co. 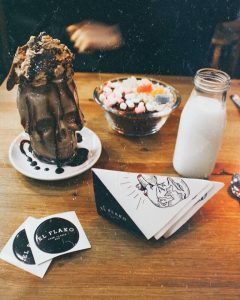 Situated in El Born, El Flako is known for being the #1 cereal café in Barcelona, but their indulgent milkshakes will be the true star of the show when your order arrives. Although their milkshake menu isn’t extensive, each shake is a work of art. Topped with cream, chocolate sauce and other tasty treats, you’ll definitely be impressed (and super full) once you’ve attempted to finish one of these. If you don’t fancy something too over the top, be sure to order your cereal with a flavoured milk for the ultimate taste combination without feeling too guilty. What’s more, El Flako also offer plenty of yummy smoothies and juices, so there’s something for everyone on their menu… besides, who doesn’t like cereal?! 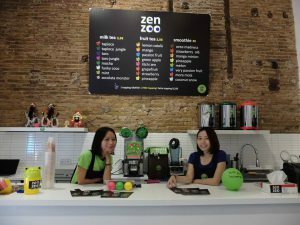 Located in the heart of Raval, Zenzoo is primarily a bubble tea café, although is also well known for its tasty milkshakes and smoothies. Ordering at Zenzoo is a 4-step process; first you choose your base, followed by the size you would like, then the flavour and finally the toppings. Their milkshakes come in plenty of yummy flavours such as ‘oreo madness’, ‘vanilla café’ and ‘strawberry olé’. Their smoothie flavour collection is also impressive, with choices such as ‘mango minion’, ‘very passion fruit’ and ‘green apple’. The shop has a relaxed vibe, with colourful décor and a comfy seating area for you to sit back, relax and enjoy your personalised Zenzoo drink! 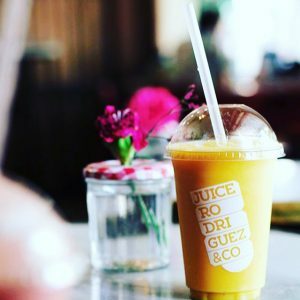 Rodriguez & Co. is a healthy brunch spot situated in the Eixample neighbourhood, and is perfect for those who fancy a tasty drink minus the guilt. Their drinks menu consists of an endless selection of fresh juices and smoothies, as well as a few scrumptious milkshakes. The best part about the milkshakes is that they are still super healthy, blended with your favourite type of milk whether it’s soya, almond or cow’s milk! For that tropical summer feeling, we recommend the ‘Malibu’ smoothie, made with apple, pineapple, fresh coconut milk and frozen yoghurt – yum! 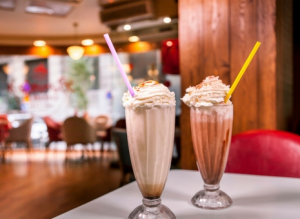 Where better to enjoy a delicious shake than an American-style diner? Situated on Via Laietana, Bernie’s diner offers traditional milkshakes in simple flavours such as chocolate, strawberry, and vanilla. However, their signature ‘special shakes’ will be sure to impress anyone with a sweet tooth. They come in adventurous flavours such as strawberry cheesecake, cookies & cream and for the adults, coffee & baileys! For the full American experience and if you really want to treat yourself, why not pair your milkshake with a classic burger or hotdog? – We’re sold! Located less than a minute from the beach, Surfhouse is the perfect spot to fill your desire for a refreshing drink after a long day of sunbathing. 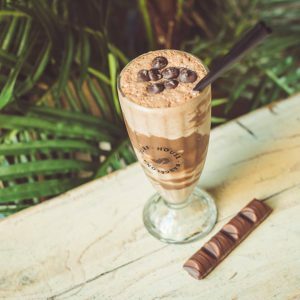 Their signature milkshakes will take centre stage on their drinks menu for the sweet toothed amongst us, with flavours such as SHBueno (kinder bueno) and oreo. In terms of juices and smoothies, the options are literally endless, as they offer the option to create your own smoothie from scratch with your favourite bases and fruits! As well as this, they pride themselves in having a ‘smoothie of the month’, based on the best flavours of the season – if that’s not dedication, we don’t know what is. With plenty of fruity smoothies and creamy milkshakes to decide from, you will be spoilt for choice at Surfhouse!